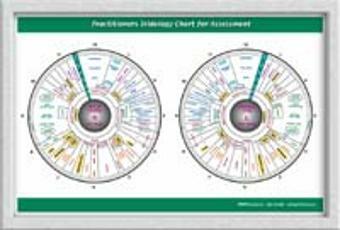 This beautiful laminated color chart contains the most recent information from the International Iridology Practitioners Association's research department. The chart includes all organ and body systems, color coded to the chakras. This chart is a combination of four charts in one. It is an 8 1/2 x 11 folded, 4-sided, full-color laminated chart. On the inside both sides have all the information of a regular Iridology chart, left and right iris, with all of the most recent information from worldwide research including all organs and body systems. In addition, this Spirit Soul chart has all of the emotions that relate to each organ or body system, and each organ or body system is color coded to the related chakras. Also included are the identification for male and female (yin & yang) and the numbers for the ages of emotions, events or occurrences. The front of the chart has all of the information to identify signs during the actual analysis, showing the iris influencers, indicators, and pupil signs. It also has the color code for the chakras. On the back is a chakra guide, explaining all about the chakras. 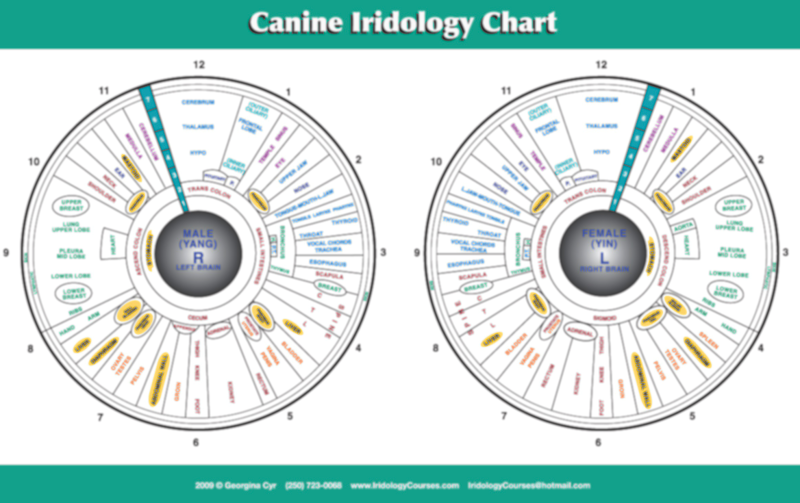 These beautiful laminated color charts contain the most recent information on Canine andFeline Iridology. This package includes 2 charts (1 Canine and 1 Feline). Each chart includes all organ and body systems. 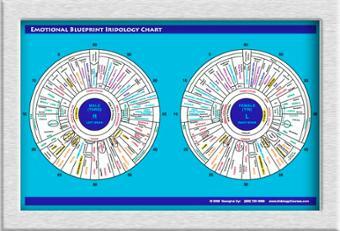 This is an Iridology Training PowerPoint presentation with color photos of each of the main 40 Iris signs. It is a great Training tool an quick reference to the main Iris Types and Signs. (We also have a PDF version of the PowerPoint for those who do not have PowerPoint on their computers). These forms are wonderful for quickly deciding which body systems to work with, for the person whom you are doing an Iris Analysis. You will receive a biliary, lymphatic and hematogenic form as well as the Iris Analysis Body Systems Form. (4 forms total) You simply put a number corresponding to each iris sign listed as to whether they are mild, moderate, or significant (1, 2 or 3) in the boxes and total the boxes up at the bottom of the page to see which system is the most out of balance The examples of systems would be: Circulatory, Digestive, Eliminative, Intestinal, Nervous, Respiratory, Urinary, Structural, Glandular, Lymphatic or Immune system. PLEASE NOTE: These forms come as a package with the Body Systems analysis form below for the $15.00 price. 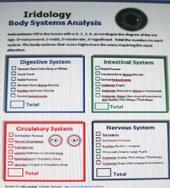 The Body Systems Analysis Form is an additional form that provides more confirmation about which systems might need assistance in balancing, based on additional Iris Signs in relationship to the Digestive, Intestinal, Circulatory, and Nervous systems. Instructions: Fill in the boxes with a 0, 1, 2, 3, according to the degree of the iris sign. 0=not present, 1=mild, 2=moderate, 3=significant. Total the numbers in each system. The body systems that score highest are the ones requiring the most attention. 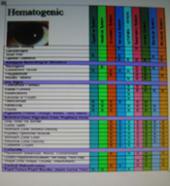 PLEASE NOTE: These forms come as a package with the Colour coded Iridology analysis forms above for the $15.00 price. As Camera Technology is advancing so quickly, we advise you to contact Bernard Jensen International. Iris magnifier and light in one – Available through Bernard Jensen International along with many other Iridology products.